Premier Senior Living, LLC, a senior living company with 23 assisted living and memory care communities throughout 6 states, is offering free meals to federal workers during the shutdown. New York, NY, January 24, 2019 --(PR.com)-- Premier Senior Living, LLC (PSL) is stepping up and offering free meals to federal workers going without a paycheck during the federal shutdown. 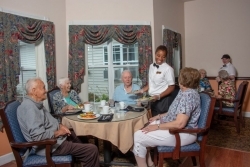 Federal workers are encouraged to stop in and dine at one of PSL’s 23 assisted living and memory care communities located throughout 6 states - MI, NY, OH, WI, NC, and PA.
"We're all Americans and we want to do our part to help those in need," said Wayne Kaplan and Robert Borsody, owners of Premier Senior Living, LLC. Meals are prepared and served between the hours of: 8 a.m. – 10 a.m., 12 p.m. – 2 p.m. and 5 p.m. – 7 p.m. Identification will be required. Premier Senior Living, LLC, headquartered in New York City, owns and manages an array of senior living communities that offer assisted living and specialized assisted living services for the memory impaired. Premier Senior Living has 23 locations throughout MI, NC, NY, OH, PA and WI, and is committed to setting the standard of excellence in seniors’ assisted living communities. With a mission to champion the quality of life for seniors, Premier Senior Living continues to identify seniors’ assisted living housing opportunities in urban, suburban and rural areas. To obtain more information on the exact locations of the PSL assisted living and memory care communities, please visit PslgroupLLC.com or call 1-800-380-8908.